No, I don’t mean your uncle Jack’s “wife” Mimi. I mean the best beard in DC Sports: Jayson Werth’s beard. Pitchers and Catchers don’t technically have to report in Viera, FL until Wednesday, but several players arrived early to start their Spring preparations, and among them is new outfield Jayson Werth. I mean, the beard has its own twitter account, people. How can you not love that? 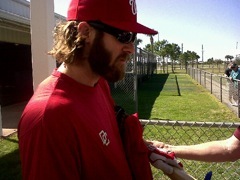 There may be some team rivalry going, though, as Stephen Strasburg was last seen sporting an Abe Lincoln. (1) Brian Blessed didn’t say this. He probably should have. The baseball beard is a San Francisco Giants thing!! Werth and Strasburg should create their own, Nationals tradition, rather than steal it from another team. I had no idea that beards were specific to a city. It isn’t specific to SF, but Suzy is right – this is just a rip off of Brian Wilson. Get some originality, boys! I believe Werth’s sported a beard for most of last season, whereas Wilson just started growing his in August. And here I thought they were all ripping off the facial follicle stylings of pre-treason Johnny Damon. Man that guy could grow a beard. I wonder whether he’ll get it back now he’s out of pinstripes. Omg, I can’t believe I’m belaboring the point, but… Brian was already nicknamed “The Beard” and his beard got his own Twitter account last year. So, to welcome “The Beard” is to welcome B-Weezy. Thanks for the shout out, WLDC. :) Go Giants! Well, if I really wanted to belabor the point I could bring up Kevin Youkilis’ goatee, which has been auctioned off twice, has a webpage/blog/twitter, and has a following of its own. But that would be ridiculous. Seriously though? I salute all amusing hair in sports. Wow, so a team wins a World Series and suddenly they own facial hair? If we really want to get picky, playoff baseball beards are ripped off of playoff hockey beards.